This week I have been busy turning my back momentarily to settlement archaeology and my overlong draft of an article that I have to return during the summer in order to take up funerary archaeology and face a series of manuscripts, some from other people, some wholly or partly written by me, that take me to the world of funerary archaeology. Yes, it is time to get the Remembering the Dead project done and dusted. Although there are drafts, there is also quite a lot of work ahead. Well, I must be honest – even if I am not working on pre-Roman settlement archaeology, I still have to at least plan to do some new analyses in order to fix two large holes in our Roman publishing programme for the Nepi Survey Project. This is the time of the year when many organisations look for personnel for the next winter or different foundations have their application periods. This means that one has to start dreaming up projects that may never really see the light of day, since the financing bodies think there are more important things to fund. It is the time for blue-sky thinking and if not pies in the sky then at least proposals and plans to paper one’s walls with many times over. Nevertheless, instead of dwelling in what may be, may to come or might have been, I can marvel at the research one of my colleagues is carrying out at the moment. On the paper the title ‘Polygonal columns in ancient Greek architecture’ may sound traditional and even uninteresting in the modern archaeological world of identities and networks. However, sometimes one has to have a simple project in order to be able to find truly new things. Nobody has really paid any attention to polygonal columns and I as one has to admit that it would not ever have occurred to me. However, this state of uninterest means that Therese Paulson has an original research topic nobody is studying at the moment. 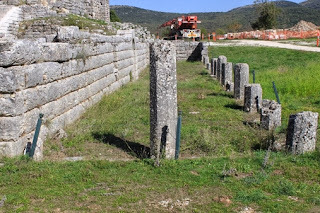 She has already travelled around Greece in search of polygonal columns in order to record and measure them, since most of the time the best records she gets in old publications is a rare sentence that “there were some polygonal columns”. No numbers, no descriptions, no measurements. Thus, her first task is all about very basic research and basic data collection. Tessa presented her preliminary results from Greece in our research seminar at Stockholm and it all sounded very interesting. Not only are these columns distributed across the then Greek world but they also are more common in specific regions. Tessa herself has been emphasising the economic aspect in choosing this column type in different kinds of buildings. After all, carving a, let’s say, 8-sided column instead of seeing the trouble of fluting the column fully saved time and can be economically sound. However, there may have been local, aesthetic preferences, too, although there is nothing wrong if the economic explanation can be proven.